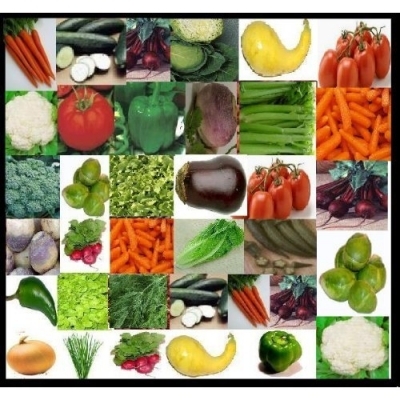 Fresh vegetables are so much better tasting, so don't deprive yourself due to lack of outdoor space or cold weather! Learn how to plant vegetables indoors if you want the taste and benefits from eating fresh vegetables, but don't have the outdoor garden space to grow them. Let me show you how easy planting vegetables indoors can be for any gardener that wants to enjoy fresh veggies year round. You can grow tomatoes, lettuce, or radishes right from your own indoor space! These can make an especially interesting houseplant, too. Realize, though, that these plants will need more sun, more water, and more fertilizer than most houseplants. Learn how easy it is to plant a healthy indoor vegetable garden or an indoor herb garden. Also find out about the newest technology in year round gardening and where to shop online for all your gardening needs today! To begin your indoor vegetable garden, gather up any planters or containers that you can punch holes into. Also you'll need a tray to put underneath your planter or container to catch any water. Punch about 4 holes in the bottom of the container for drainage purposes (if your using a plastic milk container or something along those lines. After you have your containers, you'll need a few gardening essentials. Buy a big bag of potting soil, pete disks or pellets, small garden shovel, watering can, gardening gloves, and of course the vegetable seeds. Decide what vegetables that you want to grow. Three really good indoor vegetable plants are cherry tomatoes, lettuce, and radishes. Plan on starting your tomato plants from seed. The following tomatoes are good for planting indoors: Tiny Tim Tomatoes, Sweet Baby Girl Cherry Tomatoes, and Sugar Daddy Cherry Tomatoes. Sow the seeds in individual compressed peat disks. When soaked in water, these disks expand to small, 1-inch pots complete with soil mix and plant nutrients; all you do is add the seed and water and care for them until the seedlings emerge. Plant three or four seeds to a pot, and snip off all but one of the seedlings after they're up and growing. When each seedling has acquired three or four sets of leaves, plant it, peat pot and all, into a larger pot - 8 to 10 inch for the miniature or cherry tomato, a 1-gallon container for larger tomatoes. 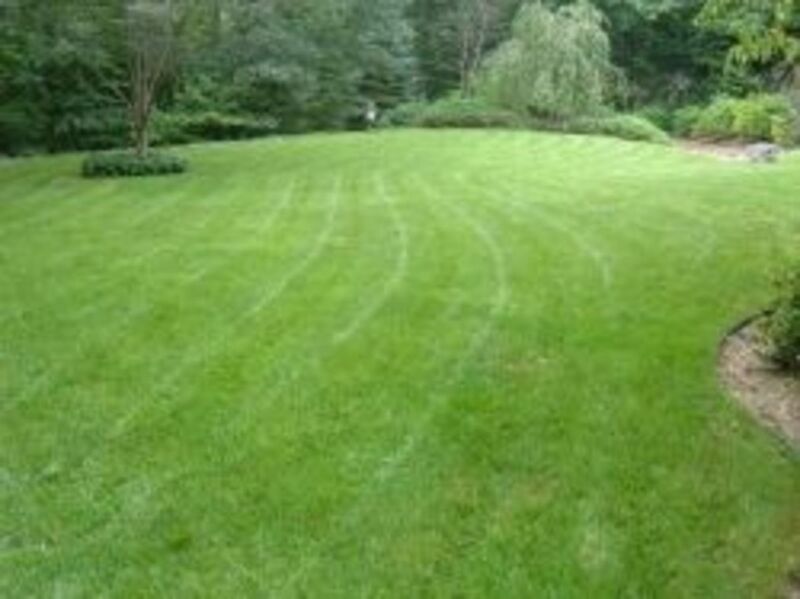 Fertilize the plants at transplanting time, again in three weeks, and about once a week while they are producing fruit. If you want homegrown cherry tomatoes for the December holidays, start your seeds no later than the middle of October. Protect the plants from drafts. 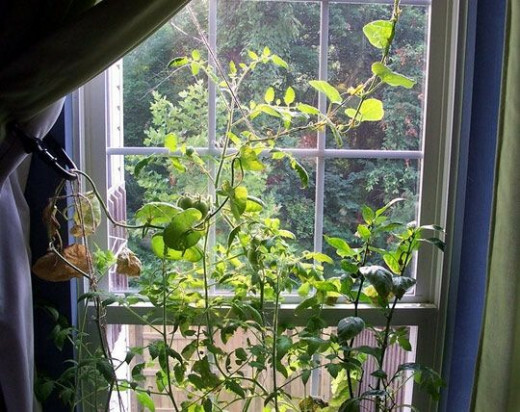 If necessary, rig up a small screen between the plant and the window to protect from drafts during the night. Tomatoes raised indoor may need a substitute for the bees and breeze to accomplish pollination; otherwise, the plants may bloom but not set fruit. 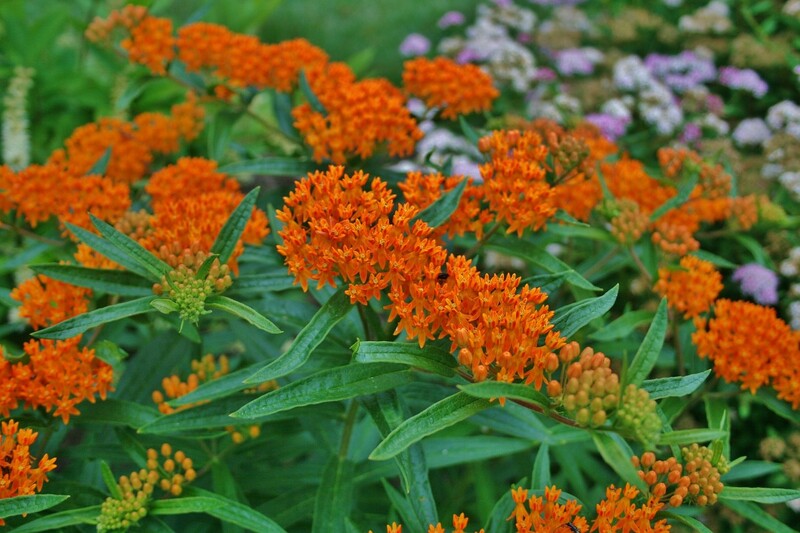 Each day while the plants are in blossom, give them a gentle shake to distribute the pollen. Remember, too, that new blossoms will be opening each day over quite a long period of time. 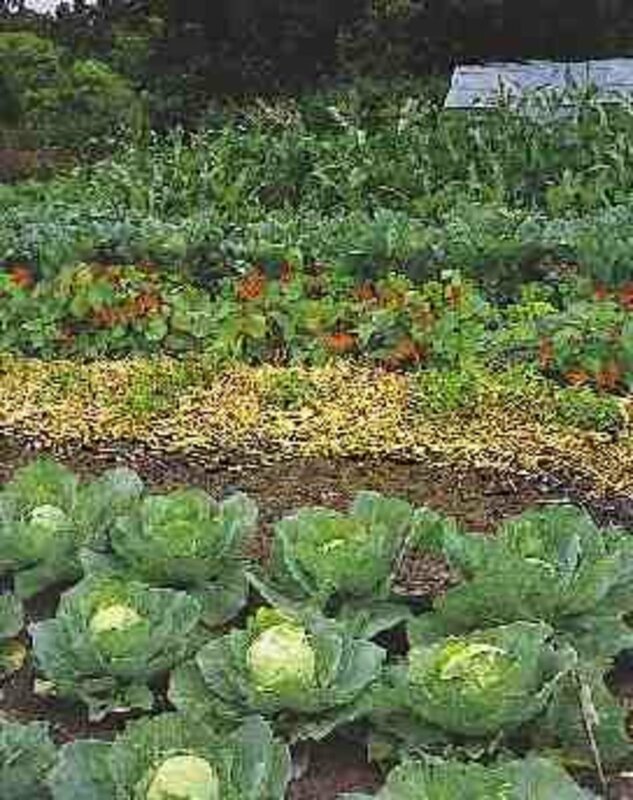 Grow Vegetables in the Winter! It's extremely popular for people that like to cook with fresh herbs or vegetables, gardeners that want to grow in the winter season and anyone that likes fresh flowers, herbs or vegetables year round. The AeroGarden is a no-dirt, no-mess Plug & Gro system that makes gardening fun, easy, and foolproof. It even controls the built-in grow bulbs and tells you when to add water and nutrients. The AeroGarden takes all the guesswork out of growing flowers, herbs and vegetables indoors! Why buy shipped fruits, veggies, flowers and herbs from afar when you can grow them right at home? Of course, getting a jump start on the growing season, as well as extending it into the fall, is always a plus. Ideal for pollinating plants, protecting starts, and displaying flora in full sun, these indoor greenhouses fit in in any room, at the corner of the garden, on the deck, patio or balcony with ease. Of course you need seeds for growing any garden. I like growing lettuce the best out of all the vegetables. It tastes so much better. Of course, we all know the biggest advantage of starting an indoor herb garden is that it is a cost-effective and convenient alternative to buying herbs at much higher prices in a supermarket. Having an indoor herb garden is a wonderful idea! Growing herbs indoors not only allows to to snip parsley, basil, oregano, rosemary, or mint and add them to recipes when cooking, but did you know that growing herbs indoors offer another delightful benefit? Growing herbs indoors also can allow you to add a wonderful fresh fragrance to your home! If your considering growing an indoor herb garden, follow these tips to get the best results. Basically, indoor herb gardens require at least 4-5 hours of light, water, air humidity, and freedom from droughts and extreme temperature. Kitchens are probably the best place to grow an indoor herb garden! 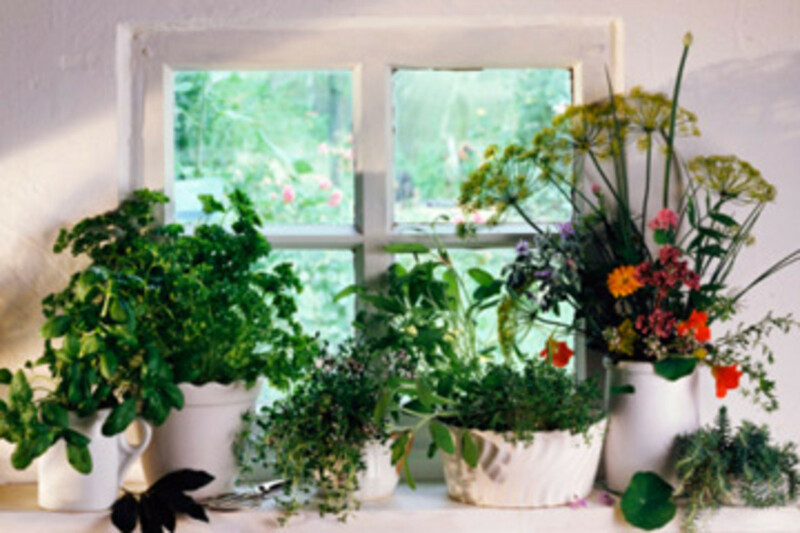 Remember to place your herb garden containers by the sunniest window in home for the best lighting. Most herbs grow better and look more attractive when placed in groups. 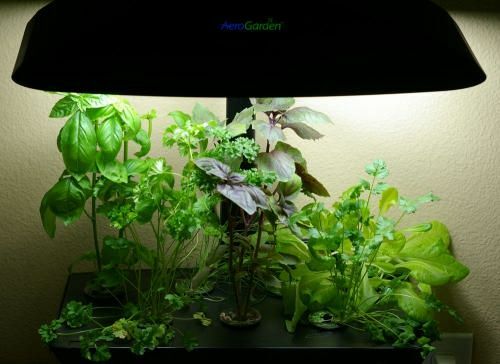 If sufficient light is a problem consider a grow light, or for a great indoor garden that is lighted, grow fresh herbs indoors with an areogarden. 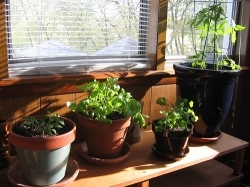 Indoor herb gardens prefer an ideal temperature of about 60-70 degrees. Herbs will tolerate the temperature range of 45-75 degrees, but they will not thrive for long. Water an herb garden making sure you don't over water it. The soil should always be moist, but not drenched. Your indoor herb garden can have any number of herbs depending on the amount of space your planting them in. If the area that your planting your herbs in is small, you might want to keep the amount of herbs you plant to a minimum of four to five herbs. Add that special fragrance to different rooms in your home. Below are a few ideas on how to use herbs to add a fresh and natural smell to a room. *Grow a clipped bay or sweet myrtle in a sunny entrance hall. *Peppermint smells wonderful in the moist air of a bathroom. *Healing aloe vera next to the medicine chest. *Grow scented geraniums, sage or lemon verbena to scent a livingroom. *Soothing lavender smells wonderful in the bedroom. *Hanging herb baskets that are planted with sage and trailing catmint in a stairwell. *Culinary herbs can be planted in wall planters on a sunny kitchen wall. Lettuce is a good nibble crop and an attractive houseplant, so whether you grown enough to make a full-scale salad every week is really irrelevant. Choose a container wide enough to allow for two or three rows, and you can wind up with a real lettuce-bed look. Sprinkle the seeds on the surface of the dampened soil. Cover very lightly with more dampened soil mix. Lettuce likes lots of water, too, more than most houseplants. Prop your lettuce beds up close to the lights while the plants are still seedlings, but lower them as the plants grow so that the tops are 10 inches or so away from the lights. Fluorescent lights do not give off much heat, but even so, lettuce likes it on the cool side, and leaves will tend to be limp is they are kept too close to the light. You can thin out a few seedlings for eating within three weeks and then begin to take outer leaves by the following week or so. New leaves will put out for a couple of months, at which point they begin to toughen. If you are following a reseeding program, new plants will be coming along to take their place. 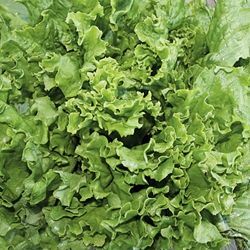 The best lettuce varieties for indoor planting are Oak Leaf, Tom Thumb, and Buttercrunch. While these are good sunny windowsill crops, they can also make it snuggled under the fluorescent lights with the lettuce. Sow radish seeds in the container in which they will grow. After the seedlings come up, thin them out to at least 1 inch apart, so that each radish will have room to grow. Radishes grow quickly. They also use up more water than ordinary houseplants because they are forming the crisp, tender roots that you will be eating in three to four weeks. Plant a new seed for each radish you harvest, and you can keep a sort of radish reforestation program going indefinitely. Radish tops make attractive greenery, producing something between a rosette and a fountain effect. Grow the variety called Cherry Belli. 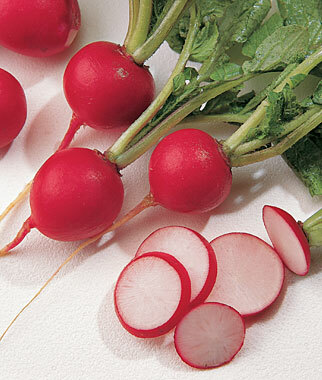 It's a smooth, round, bright red radish, crisp and tender, with short tops that make it a good choice for a houseplant. The radishes take twenty-four days from seed to table. 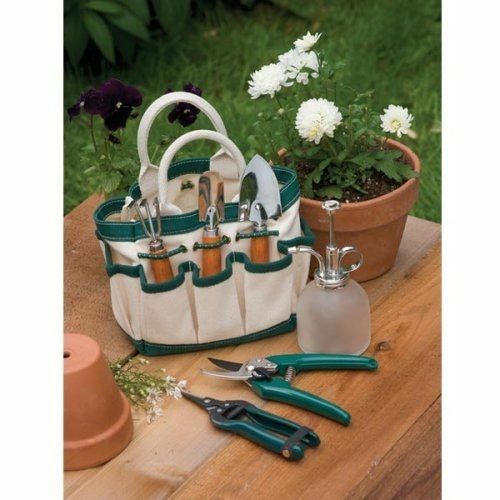 Bring all your gardening necessities with you with this Garden Tote Tool Set! Includes the tools you need to care for houseplants and container gardens. Attractively packaged, this is a great tool set for any gardeners who wish to keep their tools neat and organized! Do You Have an Indoor Vegetable Garden? Yes, I have an Indoor Vegetable Garden. Not yet,maybe I can make Indoor Vegetable Garden for next months.Thanks for the info. I'm trying my hand at a few things inside this year. I have 2 celery stalk re-growing, some basil and spinach. I wish we had more window space open for the plants to get sun. I want to garden indoors all year long. I can't believe this. I wish I was like you. You are so good in gardening. I've always grown herbs inside the house. They do quite well once you get the hang of it. I really wish I had a green thumb! We do have a pumpkin plant that has managed to survive since Halloween. I really hope we get a few pumpkins when we move it outside. What a great idea! I wonder if this reduces pests? I had no idea you could do this! Pinned to my gardening board and blessed. I do not have an indoor garden, but after reading your lens I am thinking of starting one. Thanks for the great information. Lovely way to grow veggies. Here in Durban South Africa we get daily visits from mischievous monkeys who like pick and eat the fruit and veggies, so I am always looking for alternative ideas for my veggie garden. Thanks for a great lens! Perfect for those living in high rise apartments. Love the idea of growing herbs indoors! Thank you for sharing. Great ideas! Great Information. Living in a townhouse has left me with no room for a vegetable garden until now. I'm looking forward to starting my own indoor garden, and enjoying fresh produce year round. 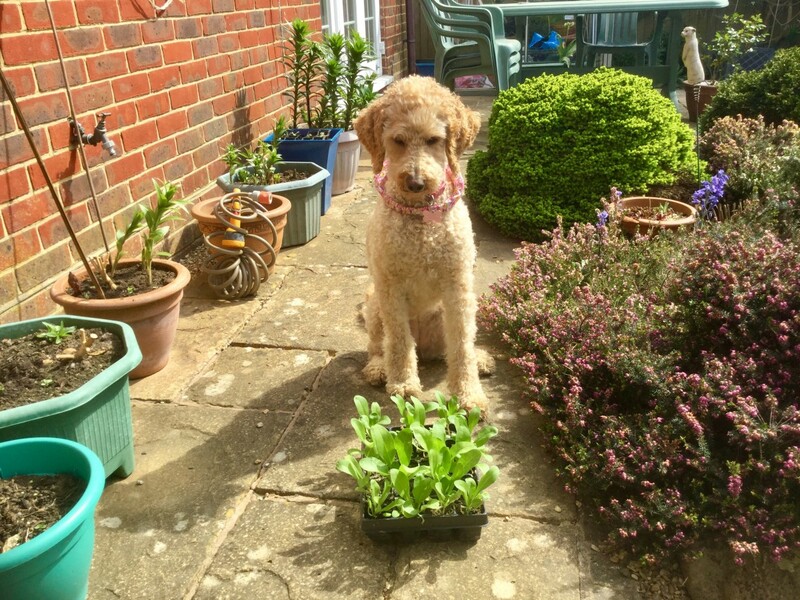 I tried growing lettuce indoors last year, they started out good but then went downhill. I think I'll try again. I don't but think this would be a really fun project. This is fascinating -Indoor Vegetable Garden-thanks for the tips! a great lens. have a conservatory at our new house and it makes good sense to give indoor growing a try. I've grown sweet peppers indoors this year; they took better than last year's garden grown efforts. Now where in China can I find some vegetable seeds? I love indoor plants and I love growing vegetables. I will have to give this a try. We have small paprika's and tomatoes, also some house plants and such. Informative lens. Unfortunately, I don't think any of my home's windows will let in enough sunlight for an indoor garden. Sigh. First year growing produce outside, want to see what I can do inside now. Thank you for the lens/information. I am starting one!!! :) Will keep your lens nearby for some tips!!! Thanks! this is the perfect lens for me. I live in an apartment but didn't realize how much can be grown inside. I'm trying the tomatoes first. You have so many great planting ideas here! Thanks for the info! This is so great because I don't have a yard and don't plan to but I really wanted to grow my own vegetables. I bookmarked it so I can do that. Wonderful lens. I bought the seeds and a perfect windowsill planter, but seasons changed and they are unused, but i enjoyed learning more here. The only problem with growing cherry tomatoes inside is that I eat them all straight off the plant and never save enough to make a salad or something. Great advice and attractive photos! Great lens! I've grown tomatoes indoors before, they were so delicious and sweet. I soon had to put up a greenhouse in the garden to grow more. You have so much useful info here. Great lens...I hope to do a bit of indoor gardening at some point, but right now I'm getting ready for my outdoor garden season! I will my indoor vegetable garden in stacking planters and hanging baskets, when the plants are bigger. Very nice, I never think to plant vegetable indoor, I always worried that if the plant get not enough sun light, it will not grow as good as plant it outdoor. I love the indoor herb garden above! One doesn't generally think of having an indoor vegetable garden. You have explained how this too can be done. Very well presented lens. Not yet, but may have to invest some time to making one. Thanks for the lens. Will surely try it.Check out my lenses. Thanks for the great information about growing vegetables indoors. I had never thought of growing vegetables indoors and it is certainly a great option for those who don't have any garden space. Now everyone can have a green thumb. The only challenge for me would be that I don't get much sunlight on my side of the building but my house plants are certainly happy. Excellent tips. Thanks! I am in a gardening frame of mind. Ready to start growing exactly the types of foods you have featured here. Appreciate the ideas and the resources. I love indoor gardens! We always have issues with them in winter, though, since our house is north/south facing. We get no light! And our cats like to eat them. All that's survived is our lone aloe cactus. Can't wait to live in a east/west facing house. I've been experimenting with growing a few herbs on my north-facing kitchen window sills for a few weeks, but they do not get enough light to thrive. I will snip them for recipes as long as they will grow. My plan now is to attempt to root cuttings as the plants become too leggy, then plant and harvest them until they stop growing. I have contemplated growing herbs inside ... and need to just give it a college try this year. Love this lens! I don't currently have an indoor vegetable garden. I am working on a greenhouse so I guess that will count. These are some good tips. Thank you. We don't have an indoor vegetable garden but with this world food shortage I will consider having one. I've done indoor gardening, but didn't realize you could do tomatoes or lettuce. I would like to give it a try, but don't have the space I used to have. Hmm, I have to start thinking about this. I Will share the idea with my wife, she would love it. Thanks for the info. Gorgeous lens! I love, love, love my two Aerogardens! They produced tomatoes for 18 months before I decided to retire the plants out in the garden this summer, and the plants are still producing fruit for me. Time to set them up with new seed pots now so that I'm able to harvest new fruit this winter again! I really really want to do this! I will be moving soon and this is one of my goals!!! Blessed! We do have an indoor vegetable garden. It really looks more like a jungle. I got some great ideas from this lens! I don't have one, but I'd love to start one, especially herbs. reat info. Some great tips, now I just need to remember to keep watering them so they don't die! My wife has an AeroGarden at work and she loves it! My husband did complain when I grew potatoes on the desk in the den...I love that plant stand, would really like to have one. I used to grow tomatoes and paprika on the balcony and the main problem was lack of sunlight. I hope one day that would be solved... Thanks for the tips! Very comprehensive lens. My problem is lack of decent light in my house, none of the windows provide a decent amount of sunlight. I've toyed with the idea of using indoor grow lights but figured the electricity costs might far outweigh the benefits. @jimmyworldstar: Jimmy, like I mentioned above lots of direct sunlight and plenty of water. thank you for all the info. i just tried to grow radishes outdoor and they got eaten. never thought of growing them inside. i will try that and see how i go. Interesting..now if I could only figure out how to grow chickens indoors, I wouldn't have to go to the grocery store. I'm afraid this would probably never work for me, my dog loves veggies &amp; I would keep wondering where they all went! Squid Angel blessed! beautiful lense, better than mine on related topic of container gardening. Thanks. Thanks for the growing tips. 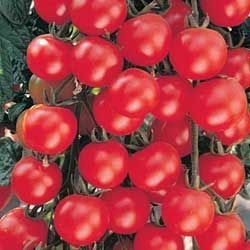 I want to grow some cherry tomatoes indoors. Do you know how often I'll need to water the soil and whether I should keep in view of direct sunlight? I grow herbs indoors but haven't yet tried any other vegetables. I might start off with some smaller tomatoes and will use this lens as a guide. Thanks so much for the great tips! Nice, that aerogarden looks like an interesting product, it will defiantly help here in England! Having the convenience of fresh herbs in the comfort of your house cannot be priced. Not to mention the financial savings you will enjoy as you need not travel to the supermarket or purchase the expensive ones off the shelves. This is an addition to the household that everyone should consider. Great lens! I do have an indoor vegetable garden. Thanks for the useful tips and showing great growing options. Great indoor gardening ideas for my short Ontario summers, thanks for sharing. nice tips to bring more green into this world. Will gladly do my part of bring more green energy to this planet. Excellent tips for growing herbs and veggies indoors. Yes, I do! What a glorious lens this is. I shall visit often. Indoor vegetable garden... that's interesting, thank you for sharing! I don't have one -- was not aware -- but might consider in the future, after I settle on a new place. Love the idea! Love plants in the house so this is great.. lot of info. I love this Lens, excellent work, very interesting, thank you so much! Sadly my husband has most available space taken at home with his cactus collection! At the price of vegetables these days I really think I might start planting a lot more inside.